I read this article and wanted to share it with you: 10 Reasons We Still Stick with Sonlight After 10 Years https://blog.sonlight.com/stick-with-sonlight.html. This post is part of the Where Are They Now series in which we hear the stories of long-time Sonlight users who are now thriving young adults. 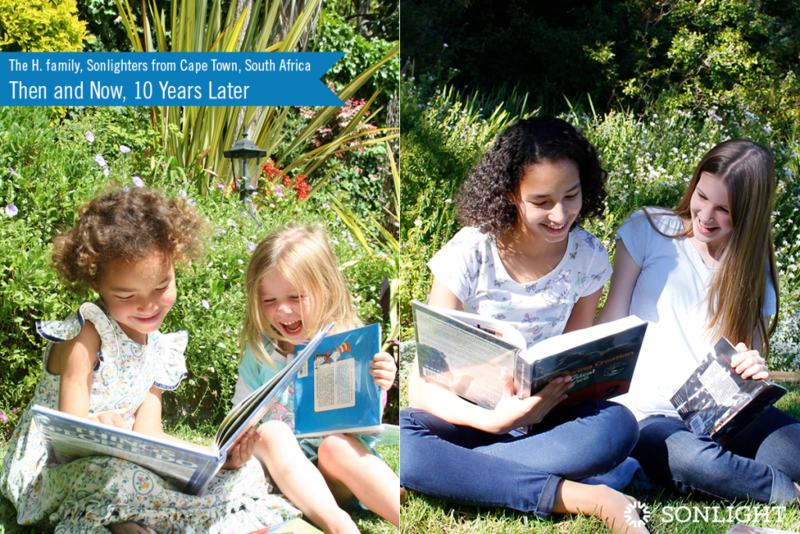 Ten years ago, when we started our Sonlight journey, we didn't know what kind of adventures our lives would bring. But I knew that it would involve Sonlight in some way or another. And I was right. Despite all the changes in our lives, Sonlight has remained one of the constants that has stayed us on our course. 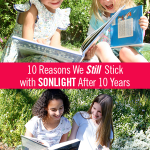 And, with our youngest being just eight years old, I suspect we will have another awesome 10 years of Sonlight. 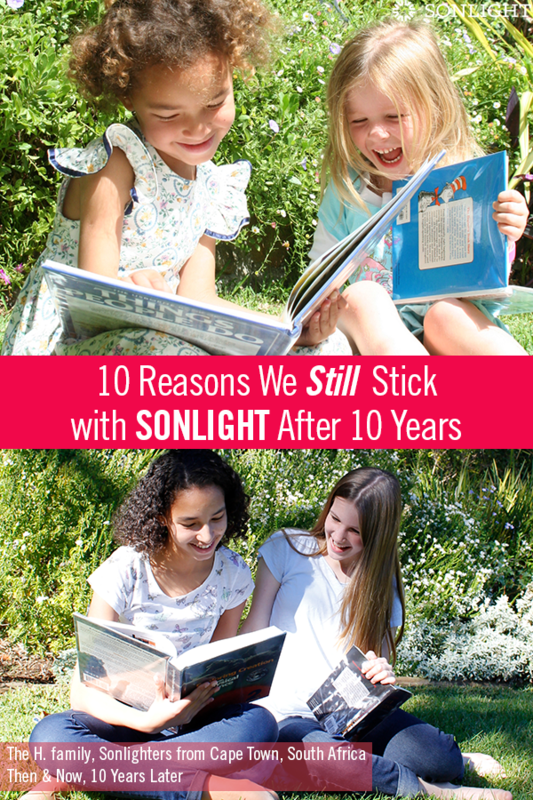 Here are ten reasons we stuck with Sonlight with Sonlight for ten wonderful years and why we will continue to do so. 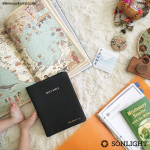 The first time I considered homeschooling as a serious option for my (then) infant daughter was when Sue, a dear friend, pressed an old Sonlight catalog into my hands. I was an ex-teacher, disillusioned with the public school system and open to exploring other options. Homeschooling was a vague thought in the peripheral area of my brain. Then I opened the Sonlight catalog. The books! The stories! The photos of happy families enjoying learning together! 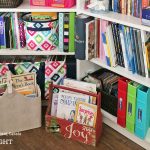 The article 27 Reason to Homeschool with Sonlight that resonated so deeply with me! I fell in love with a curriculum before I had any real idea of what homeschooling even was. I read the catalog cover to cover. I remember thinking, "Ahhhh! This is how I wish I had been taught!" only to close the back page and see the Sonlight tagline for the first time: "The way you wish you'd been taught!" A sign, perhaps? Without a doubt, the biggest appeal of Sonlight and homeschooling were the books. This intriguing idea of learning about the world around us from a springboard of excellent literature made sense to me. I had witnessed the power of stories in my own classroom, seeing even jaded teens come alive with excitement and interest when we explored deep topics through a poignant novel. My own learning had been best facilitated through living books, too. Ten years down the line with Sonlight, learning through literature has been an incredibly rewarding experience, not least of which is hearing my kids say, "Oh, that was such a great book!" or "Please read another chapter!" I wish I had kept a record of every time a Sonlight book touched our hearts or generated deep discussion. The questions that the kids ask inspire deep in discussion long after the chapter has ended. Often, discussions continue in the car or come up again at the dinner table. They may not remember every historical event, person, or date, but hearing their broad understanding of historical periods and how that impacts their worldview has confirmed time and again the value of all that we are learning. Juggling the learning needs of four kids can be incredibly time-consuming. Some families manage to cover one History / Bible / Literature program (HBL) per child, but in our family we've found that Sonlight's repeated HBL themes make it easy for us all to follow one historic theme for the year. For example, currently our family is enjoying learning about the history of the USA. While my eldest child works on Sonlight 100 mostly independently, the rest of the family gets to enjoy some of her 100 Read-Alouds together with a selection of titles from HBL D and HBL E that we already own from our first trip through US history. It's a joy to revisit old favorites as a family while mixing in new-to-us stories, too. Every encounter I've had with the people who work for Sonlight has been incredibly positive. In fact, time and again, Sonlight has gone above and beyond to help me find solutions—and always with gracious warmth. Recently, a friend gave me a slightly bent book. It turned out her Sonlight shipment included a few slightly damaged titles, something Sonlight realized before her Box Day! She was informed that her shipment would be slightly damaged but that replacement books were on the way. The second package arrived with instructions to keep the duplicates! She was amazed. (And we scored a free book!) I've yet to find a company with better customer service than Sonlight. From the customer service team to the Sonlight forums and Facebook communities, I have never felt like we have been doing the Sonlight journey on our own. Receiving and giving support to fellow Sonlighters has been such a highlight of this journey. In some ways, it's a blessing we've taken for granted. 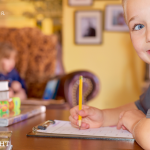 There have been times when I've scoured the Internet and homeschooling groups for great resources only to find myself back on the Sonlight site, discovering exactly what I needed has already been recommended and sold by Sonlight. Winston Grammar is one such program. I had tried my hand at this and that for grammar, never quite settling on anything that stuck. Then a friend introduced me to Winston Grammar, and I was sold. Little did I know that Sonlight carried it! In some cases, I've found a program that really works for my kids, only to discover that Sonlight has since added it to their stable. Math-U-See is one such program for which we have been grateful. Having a one-stop shop option for all our homeschooling needs has been a huge blessing over the years. Even when we took a break from Sonlight books to explore living books from my own home country of South Africa, we continued to order extra resources from Sonlight. If it weren't for Sonlight's introducing us to the Classical Kids Collection, my kids would never have come to know and love classical music. We've enjoyed ARTistic Pursuits with fellow Sonlight families and benefited from the Piano Wizard program in the kids' early years. When we finally dived into homeschooling, it was alongside the same mom who had shared the Sonlight catalog with me in the early 2000s. Our girls, both 4 years old at the time, both started with the PreK program that year. Oh, the delight! I remember those early days with great fondness. Now that they're both 14, their passions lie in different arenas from one another. One is all-consumed by musical theatre, history, and literature while the other loves all things biology, nature, and marine studies. Yet still, thanks in part to Sonlight, their friendship remains firm. 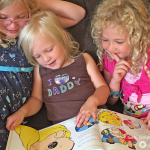 They continue to share many homeschooling moments together, from comparing their favorite readers over the years to studying the same Sonlight high school science program. 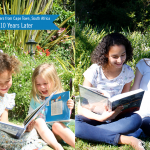 Looking back on these past ten years, without a doubt, our favorite homeschooling moments center around Sonlight. Hours spent gathered around our fireplace in the winter or outdoors in the dappled shade of our tree in the summer, reading aloud literature rich in story. Hilarious videos of Sonlight science experiments that worked—and those that didn't! Geography Songs, including "The big big sticks are the wally..." which loosely translated is "'The Pacific states are Hawaii..." as sung by our youngest, then 2 years old! Long road trips, consuming more Sonlight favorites via audiobook. And a multitude of moments with other Sonlight families sharing and delighting in all the Sonlight has to offer. Next month, our family is embarking on our biggest adventure yet. My husband's company is relocating our family from Cape Town, South Africa to Brisbane, Australia. It's been, without a doubt, one of the toughest decisions we've ever had to make with plenty of unknowns ahead of us. But schooling is not one of them. With homeschooling, we will continue with the kids' education wherever we are in the world. With Sonlight, we can enjoy doing it. Start your Sonlight journey the same way Taryn did. Order a complimentary copy of your catalog today. I *LOVE* the then and now photos. I remember that photo from the catalog, and it makes me happy to see the now version. Thank you so much for sharing!